The following interview of Brett Heath, CEO of Metalla Royalty & Streaming (TSX-V: MTA) / (OTCQB: MTAFF) was conducted by phone and email over a one week period ended July 18th. 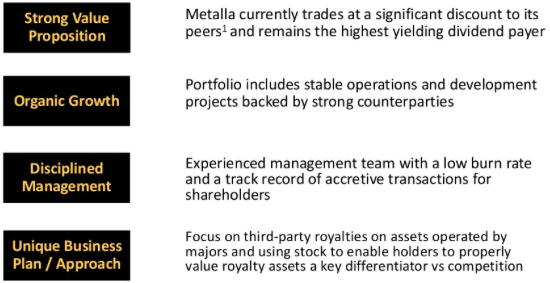 Metalla is a small-cap precious metals royalty / streaming company. The investment thesis (in my opinion) is that someday it will be acquired by a larger player in the sector. I’ve written a few articles on Metalla Royalty & Streaming and I’m happy to report that management has delivered on its promises. 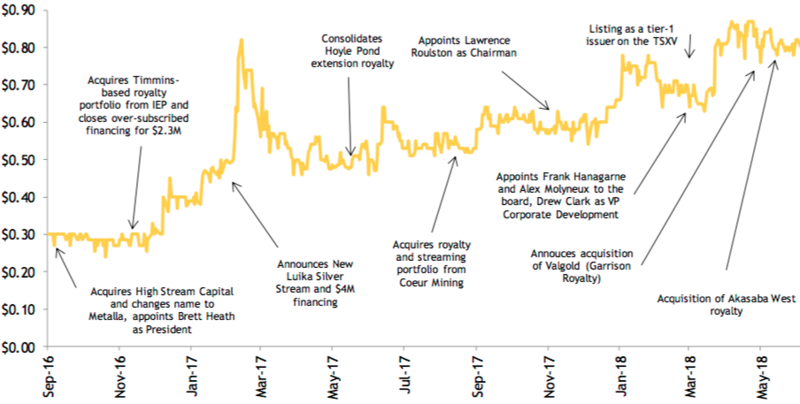 It was up-listed to tier 1 on the TSX-v, instituted and has already increased a monthly cash dividend, made accretive deals and has several more in the works (including Valgold Resources). Metalla has secured several new team members and closed a blockbuster transaction with prominent mid-tier miner Coeur Mining. Without further preamble, here’s my exclusive interview with President & CEO Brett Heath. Brett, when we first met, you had a couple of early stage royalties and a C$ 10 M market cap. Now you have a growing portfolio of producing, development & exploration royalties / streams and a C$ 60 Mmarket cap. How were you able to do this? As far as mining investments go, it’s hard to beat the stability of precious metals royalties. 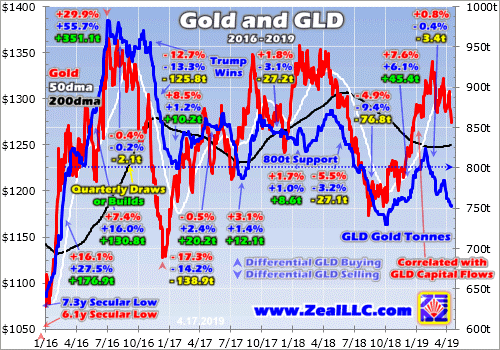 Just look at companies like Franco-Nevada (NYSE: FNV) / (TSX: FNV), Wheaton Precious Metals (NYSE: WPM) / (TSX: WPM) or Royal Gold (NYSE: RGLD). They have significantly outperformed traditional mining companies and the underlying gold price over the last decade. That success created an opportunity that Metalla, just 1/200th the average market cap of those three, has been able to capitalize on. Our size allows us to look at hundreds of royalty & streaming deals that aren’t big enough to move the needle of larger companies. Our third-party acquisition strategy has allowed us to pick up royalties on projects operated by multi-billion-dollar companies like Goldcorp, Pan American Silver, Tahoe Resources, Agnico-Eagle, TOHO Zinc and Osisko Mining (not to be confused with Osisko Gold Royalties). These strong operators will drive big premiums for Metalla shareholders as we continue to add more royalties and streams to the portfolio. How important is your team? You say that you benefit from smaller, more attractive transactions, but the Majors have deep pockets and access to top-notch financial advisors & mining experts. Our team is critical. Every deal is different. Each requires specific expertise once you get down into the details. That’s why we have a strong, full-time team and we also retain consulting experts to help us solve unique problems in the deal process. This means we have access to the same caliber of legal, technical and financial (tax/accounting, etc.) people as our much larger peers, but without the bloated payroll. Among our officers and directors we have decades of experience in all facets of the mining industry. We also have an expansive network to tap when we need a technical geologist, engineer or metallurgist to perform specific jurisdictional and mining due diligence. 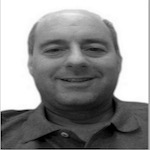 On our Board is Frank Hanagarne, Sr. VP & COO Coeur Mining. Coeur Mining (NYSE: CDE) has an EV of C$2.3 billion and vast experience with operating mines in North Americas. As you can imagine, having the COO of a successful mid-tier precious metals company on our Board is extremely useful. Frank was also an executive at Newmont Mining during the formation of Franco-Nevada, so in addition to having a strong technical background, he has in-depth knowledge and understanding of the royalty and streaming space. We also have E.B. Tucker & Lawrence Roulston, two well-known mining industry analysts / financiers / investors with admirable track records and amazing industry contacts. We recently appointed Alex Molyneux to our Board. He has a tremendous amount of direct deal-making experience and was the Head of Metals & Mining Investment Banking, Asia Pacific for Citigroup in Hong Kong. Alex lives in Taiwan and has a remarkable network of contacts, especially across Asia, that should help propel Metalla forward. Drew Clark is our VP of Corporate Development, he previously worked for Premier Royalty which was taken over by Sandstorm Gold. 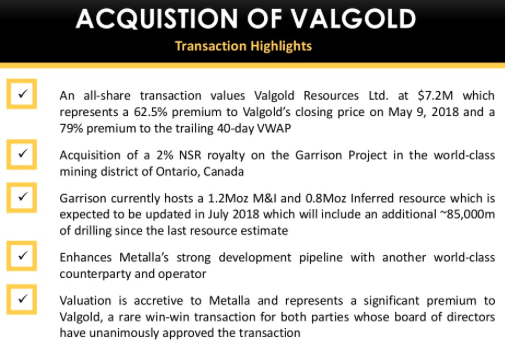 Your most recently announced deal is the outright acquisition of Valgold Resources (expected to close within a month). Please tell readers about this deal. Valgold Resources (TSX-V: VAL) is an excellent example of our business model at work. It’s an all-share transaction, so we’re not laying out any cash. Metalla’s share price has outperformed our peer group, so we don’t mind issuing a relatively modest number of new shares to lock down a highly attractive gold royalty on a potentially world-class project in the tier-1 mining jurisdiction of Ontario, Canada. The Garrison Gold project is operated by Osisko Mining, a proven mine builder. Garrison is an essential project for them. We think uncapped upside on our 2% NSR is very exciting and could produce a long-term return that’s much higher than the base case scenario. Metalla recently provided attributable silver equivalent guidance for the fiscal year ending May 31, 2019. 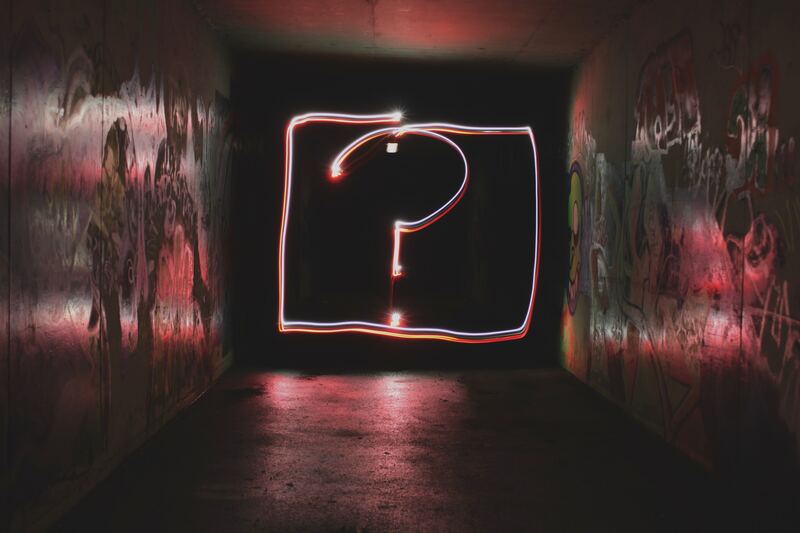 Can you walk us through your thinking? We expect sales to be roughly 500,000 to 600,000 silver equivalent ounces (attributable to Metalla). That compares to about 520,000 ounces in the year ended May 31, 2018. Keep in mind, that’s what we expect from our existing portfolio, it does not include potential acquisitions. We continue to work on a number of new deals, some of which on assets very close to, or actually in production. In our guidance we indicated annual revenue could be C$9 – C$12 M. That’s based on 500-600k attributable ounces of silver, an exchange rate of C$1.25/US$1.00 and an average silver price of US$16.50/oz. Based on our FY 2019 guidance, and assuming that the Valgold transaction closes, we’re trading at an Enterprise Value (market cap + debt – cash) to Revenue ratio (“EV/Rev“) of about 6-8 times. The EV/Rev ratio averages about 18 times for our larger competitors. 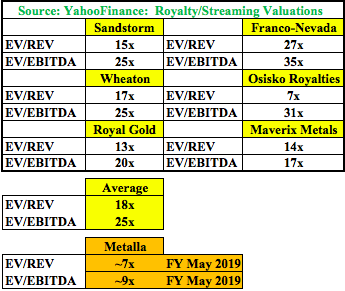 So, Franco-Nevada, Wheaton Precious Metals, Royal Gold & Sandstorm (on average) trade at nearly three times our valuation. That means there’s lots of room for share price appreciation in our opinion. Okay, thanks for that, I was going to ask you about Metalla’s valuation vs. peers…. Yes, we trade cheap vs. larger peers. To be fair, they are more established and deserve to trade at a premium, but our shareholders believe the valuation gap will shrink as we continue to add more royalties and streams. We’ve closed eight transactions since we first met less than two years ago. If we keep that pace, shareholders won’t have to wait long. In the meantime, we pay a cash dividend. The current yield is 2.4%. That’s higher than all the precious metals royalty/streaming peers. And, we pay that dividend monthly. We want our shareholders to feel like ‘Gold Landlords‘ receiving tangible cash every month. Please tell us more about your dividend policy, shouldn’t a fast growing company retain its cash flow to plow back into growth? Generally yes, which is why we don’t pay out all of our profits in the form of dividends. However, dividends are a critical part of total investment returns. Our shareholders funded the business, and they deserve a portion of the profits we generate. We expect to continue growing our dividend (but not all at once) until it reaches a payout ratio of roughly 50% of free cash flow. As a reference point, our payout ratio will be about 30% of free cash flow after ValGold closes. One more important point to consider is that a cash dividend creates a unique check on management’s behavior. Our board feels strongly that companies not paying dividends tend to be less successful asset buyers over time. This philosophy seems to be popular so far. Our stock price is holding up nicely in what’s been a tough year for gold and silver so far. Disclosures: The content of this interview is for illustrative and information purposes only. Readers fully understand and agree that nothing contained herein, written by Peter Epstein of Epstein Research, [ER] including but not limited to, commentary, opinions, views, assumptions, reported facts, estimates, calculations, etc. is to be considered implicit or explicit, investment advice. Further, nothing contained herein is a recommendation or solicitation to buy or sell any security. Mr. Epstein and [ER] are not responsible for investment actions taken by the reader. Mr. Epstein and [ER] have never been, and are not currently, a registered or licensed financial advisor or broker/dealer, investment advisor, stockbroker, trader, money manager, compliance or legal officer, and they do not perform market making activities. Mr. Epstein and [ER] are not directly employed by any company, group, organization, party or person. Shares of Metalla Royalty are speculative, not suitable for all investors. Readers understand and agree that investments in small cap stocks can result in a 100% loss of invested funds. 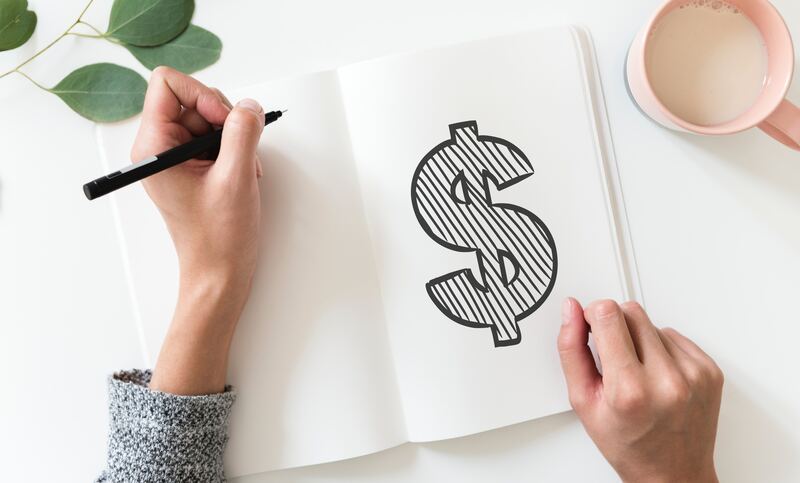 It is assumed and agreed upon by readers that they consult with their own licensed or registered financial advisors before making investment decisions. At the time this article was posted, Peter Epstein owned shares in Metalla Royalty and the Company was an advertiser on [ER]. By virtue of ownership of the Company’s shares and it being an advertiser on [ER], Peter Epstein is biased in his views on the Company. Readers understand and agree that they must conduct their own research, above and beyond reading this article. 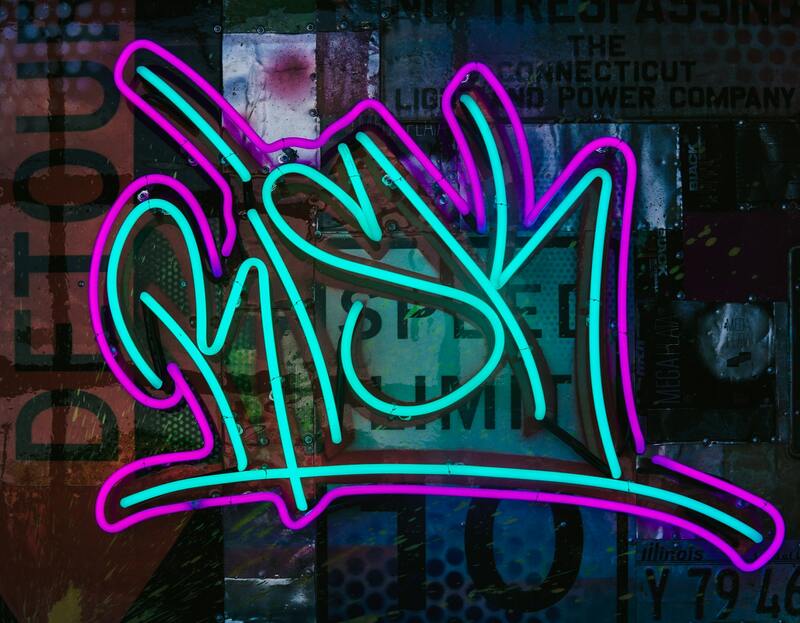 While the author believes he’s diligent in screening out companies that are unattractive investment opportunities, he cannot guarantee that his efforts will (or have been) successful. Mr. Epstein & [ER] are not responsible for any perceived, or actual, errors including, but not limited to, commentary, opinions, views, assumptions, reported facts & financial calculations, or for the completeness of this article. Mr. Epstein & [ER] are not expected or required to subsequently follow or cover events & news, or write about any particular company or topic. Mr. Epstein and [ER] are not experts in any company, industry sector or investment topic.